Sometimes it is hard for people to choose between wallpaper and paint, but different uses and applications usually dictate what route you go in. If have decided to use wallpaper in your home, or place of business, and need It to be installed, your professional painting company will be able to give you a quote on how much it will cost. Another benefit of using a company is that they can help you to choose colors and designs of wallpaper that they have to offer. The actual installation process of wallpaper also goes along much faster than painting. Once you have chosen a color and design, the first step for the company will be to remove any wallpaper that might already be on the wall. After this process is done, the wall will now be ready to install the new paper. An application will be put onto the wall that acts as glue for the wallpaper, and then the wallpaper will be rolled onto the wall. After it has been installed, the next step will be to make sure it is completely flat, and no bubbles are present. This will give it a painted look, but at the same time offers designs that are hard to paint onto a wall. What will make or break the way the wallpaper looks will be if there are any imperfections in it, and the looks will also be dependent on how well each piece was seamed. Some walls are too big for just one solid piece of wallpaper, so there will have to be a seam. A professional will make it to where anyone will barely notice the seam was ever even there by matching the design up perfectly between the two pieces. Matching up an intricate design will only be able to be done by someone who has installed this type of product many times before though. Overall, the entire process of wallpaper installation is time efficient, affordable, and will last a long time. The glue application that is used will hold on the wallpaper for many years to come. This means you won't have to replace it after a few years. Many people know that after five or so years, their paint will need a lot of touch up work from people touching it, and this is where wallpaper shines. 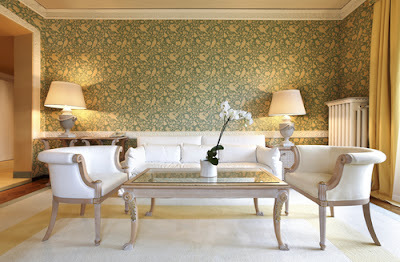 If you are looking for that different design that just cannot be done using paint, look into wallpaper as your solution. Wallpaper has come a long ways in recent decades, gone are the nauseating floral patterns and nightmarishly difficult application and removal processes. Wallpaper today is a viable, stylish alternative to decorative paint and faux finishes that won't make you want to rip your hair out during installation or removal. Durability has also increased, making modern wallpapers less susceptible to scuffs and tears and more resilient to scrubbing and washing. The durability of wallpaper today matches or even exceeds that of painted surfaces. Thanks to an influx of creative designs and manufacturing improvements, wallpaper has bounced from the proverbial edge of interior decor back into the mainstream. This article covers the three most commonly used types of wallpaper materials and their strengths and weaknesses. This guide will give you a good idea as to the different characteristics to be aware of when choosing wallpaper, and how those characteristics affect the performance of the wallpaper. First let's cover the two key considerations: durability and 'clean-ability'. Durability is the ability of the wallpaper to stand up to the various abuses it will be subjected to. These can include abrasion, impact damage, and moisture damage. It is particularly important to have durable wallpaper near high traffic areas and in areas that are prone to high levels of moisture. These areas include entryways, laundry rooms, kitchens, bathrooms, and kids' rooms. Closely related to a wallpaper's durability is its ability to stand up to cleaning chemicals and scrubbing. This is less important in low traffic areas or areas that are out of reach, as they will not need to be cleaned frequently. But areas that will be subject to frequent staining and cleaning such as in the kitchen or bathroom will need to be covered with a wallpaper that can stand up to repeated scrubbing. 1. 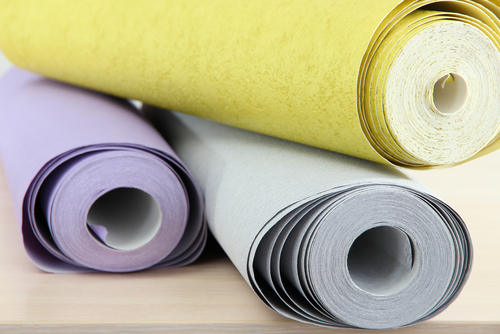 Vinyl Coated Paper is by far the most commonly used wallpaper. Its popularity is due to its balance of cost effectiveness and durability. Vinyl Coated Paper consists of paper treated and sealed with acrylic vinyl or polyvinyl chloride. Vinyl Coated Paper is known for being easy to clean and moisture resistant. It is appropriate for virtually all interior residential applications including tough areas like kitchens and bathrooms. 2. Paper Backed Vinyl is slightly less common type of wallpaper (although it is still widely used). It is sometimes known by another name: Solid Sheet Vinyl. Paper Backed Vinyl is used less often due to its inferior resistance to impact damage and abrasion. Also, it does not hold up as well as Vinyl Coated Paper to cleaning and scrubbing. 3. Finally there is Fabric Backed Vinyl, by far the most durable of the three! Fabric Backed Vinyl is extremely durable and extremely resistant to cleaning and scrubbing. Fabric Backed Vinyl is generally more expensive than Vinyl Coated Paper and is found more frequently in commercial applications than residential ones. Fabric Backed Vinyl is known for being resistant to extreme conditions including excessive oil staining, moisture, humidity and frequent abrasive cleaning and scrubbing. Wallpaper is always the preferred way of decorating room's walls, because it adds color, pattern, texture and style to an boring wall. There are countless retailers that sell wallpaper, and as a result of the sheer variety of wallpaper that is available, the selections can be overwhelming. Zeroing in on the perfect wall covering for a home can depend on a number of different factors, and these factors will vary depending on what the homeowner wants to achieve in a room's design. 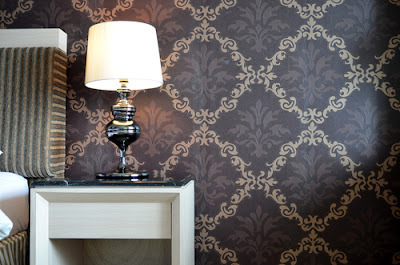 The homeowner may have a type of wallpaper in mind when they are deciding how they want a room to look. Perhaps a wallpaper pattern caught their eye when staying at a hotel, watching television or visiting a friend. The problem with falling in love with a wallpaper design in another space is that while it may look fantastic in that application, it may not look quite so great at home. That is why it is a good practice to bring a test swatch of wallpaper home to see how it plays off of the room's decor and accessories. It is helpful to work with a local vendor when buying wallpaper, because trying out different swatches is very convenient.